Two years after the fact, I still consider The Best Bad Luck I Ever Had one of my favorite books. 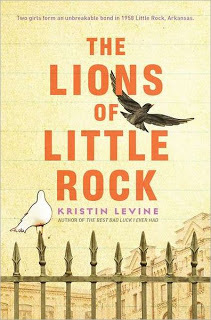 So when The Lions of Little Rock arrived – a second book by Kristin Levine – I read it almost immediately. The Best Bad Luck I Ever Had is set in a general period of race conflict in the American South, where The Lions of Little Rock deals with a specific historical event. I was familiar, of course, with the story of the Little Rock Nine – the nine black children who integrate in the high schools of Little Rock Arkansas and the public (and the Governor, who had the state National Guard on his side) was so deeply opposed to it that President Eisenhower has to send in federal troops to get the students into school. What I didn’t know anything about was “The Lost Year” which took place the following school year when the Governor, furious still at being overridden by the President and determined not to let black and white students attend schools together, closed all the public high schools for the entire year. And this is where The Lions of Little Rock takes place. Marlee is extremely shy – so much so that she really never speaks at school at all – and she’s nervous about a new year of junior high. On the eve of school’s beginning, though, the Governor announces that all the high schools will be closed. Both of Marlee’s parents are high school teachers and they must attend, even though there won’t be any students. Marlee’s school isn’t affected, since the state hasn’t yet integrated junior highs and thus there are no black children to keep out. Marlee’s school year, though, starts out quite well. A new girl, Liz, is assigned to be her partner on a big project, and Liz is everything Marlee is not – confident, outgoing, and talkative. The two really hit it off and Liz starts to help Marlee overcome her shyness. But then, to Marlee’s horror, Liz doesn’t show up to school one day and rumors start circulating that it’s because Liz is actually black, trying to pass as a white girl. Fighting back her natural inclinations to just be quiet and not make waves, Marlee seeks Liz out and they carefully try to maintain their friendship, despite the danger to both of them if the wrong people discover what they’re doing. And it’s not as if her friendship with Liz is the only thing Marlee has to worry about – her parents are arguing more and more about the segregation issue (her father thinks the Governor is being ridiculous and that the schools should integrate, her mother worries that everyone will think her husband is a communist and that it’s just better to keep the races separate), her older sister – one of the few people she can talk to – has been shipped off to live with their grandmother so she can attend school while the Little Rock schools sit empty, and JT, the boy she’s liked for ages, is using her to do his homework for him (not to mention that his older brother is always trying to catch her hanging out with Liz). This book does a brilliant job weaving in the larger back-story of 1958 with the personal struggles of Marlee (who is as likeable a heroine as I’ve read in a long while). It’s fascinating to see how some people find any reason to act horribly (if race is the issue of the moment, these people will turn on anyone at all outside the mainstream opinion), and others are willing to stand up to awful things in order to fight for what they believe. It’s inspiring to see how individuals really can make a difference, and, of course, I always love learning more about a period of history that was previously a blank in my mind. As Levine mentions in the author’s note, this was a year that made the realities of the civil rights movement real to nearly everyone in Little Rock. It was no longer a news story they heard here and there, something they could ignore. Now teenagers all over the city were sitting home and that’s pretty hard to overlook. People start having to take a side, and that’s not always pretty. This book beautifully illustrates how such events shape a community and how individuals deal with such upheaval in their lives. I hope Kristin Levine keeps writing – I’ll read everything she publishes. This sounds really interesting and right up my ally. I haven't read anything by the author, so I'll check out the other book you recommend too. Wow – this sounds really interesting! I too was unaware of the "lost year." Yup, just put both on hold at my library. What did I read before I met you? I completely agree with you, Janssen! This book is great and I, too, love how Levine weaves Marlee's story into the larger events happening around her.